During difficult times, express your sympathy and support with a tasteful gift. 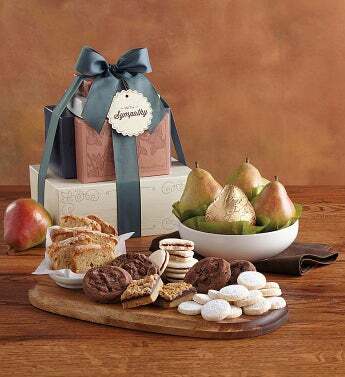 Featuring a signature Harry and David® design, this elegant tower includes a single Royal Riviera® pear presented in golden wrapping along with even more Royal Riviera® pears handpicked at their peak. It also includes peanut butter cookie bars, apple loaf cake, raspberry galettes and more sweet treats, all made in a Southern Oregon candy kitchen. During difficult times, express your sympathy and support with a tasteful gift.